In this May 31, 2016, file photo, Robert Bates, a former Oklahoma volunteer sheriff’s deputy who said he mistook his handgun for his stun gun when he fatally shot an unarmed suspect in 2015, is escorted from the courtroom following his sentencing at the courthouse in Tulsa, Okla.
A wealthy Oklahoma ex-deputy released after serving less than half his sentence for shooting and killing an already subdued, unarmed black man was recently spotted having a few cocktails at a local bar, which would be perfectly fine if the terms of his parole didn’t specifically forbid him from doing so. 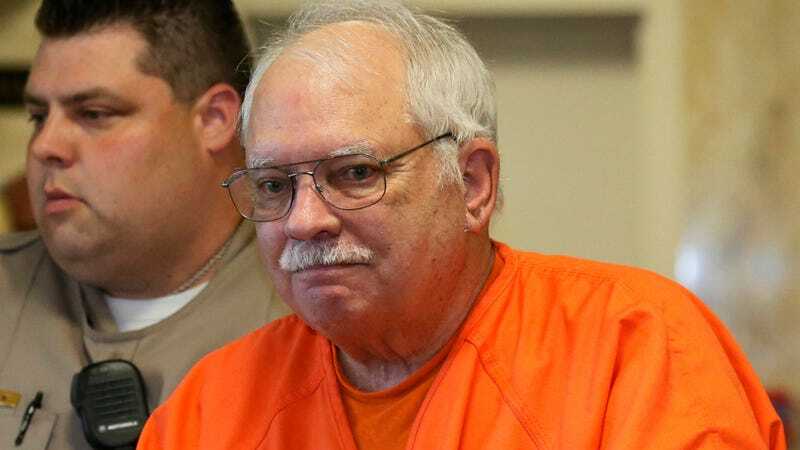 For legal purposes, we are not allowed to call 76-year-old Robert Bates a “murderer” because he was not convicted of murder. When the part-time Tulsa, Okla., sheriff’s deputy was sentenced for “accidentally” shooting Eric Harris after Harris had already been tackled and restrained by officers in 2015, he was convicted of second-degree manslaughter. Bates served 497 days in prison, which, according to my sources in a fifth-grade math class, is about 34 percent of the 1,460 days to which he was sentenced. Upon his October release, the millionaire insurance executive was sentenced to serve nine months under the Oklahoma Department of Corrections’ post-imprisonment supervision. Despite the DOC parole stipulations that Bates “must refrain from alcohol and establishments where adult beverages may be served,” in January, Bates was videotaped sitting at the bar of an Oklahoma establishment where adult beverages are definitely served. The Associated Press reports that a glass of wine was sitting at the bar next to Bates, and Pat McClanahan, a patron sitting across the bar from the manslaughterer, witnessed Bates drinking from a glass that appeared to be filled with a white liquid poured from a bottle that was labeled white wine. Of course, there is probably a good explanation for this. Maybe the restaurant serves water out of wine bottles. Perhaps Bates was taking communion. Or maybe he was being targeted, as his attorney, Guy Fortney, suggests. When a white man slaughters an unarmed black man for committing a crime, it seems hypocritical when the white murderer second-degree manslaughterer gets off with a slap on the wrist and then violates the terms of his punishment and gets off with another slap on the wrist. Tulsa County District Attorney Steve Kunzweiler, whose office prosecuted Bates in 2016, didn’t comment directly on Bates’ situation but said any decision to revoke parole depends on proof that the rule has been violated and, if it has, whether parole officials choose to act on it. “Any person who is administratively placed upon parole is granted that early release with the understanding that he or she will completely abide by the rules he or she signed upon release,” said Kunzweiler. According to Elliott, Bates could be placed under house arrest, forced to wear a GPS monitor or required to submit to increased urine-analysis tests. Bates is all too familiar with skirting the law. An investigation revealed that Bates’ police training records were falsified after the wealthy businessman contributed money and vehicles to the Tulsa County Sheriff’s Department and served as campaign manager for Tulsa County ex-Sheriff Stanley Glanz’s political campaign. Eric Harris’ family received a $6.6 million settlement after a federal lawsuit alleged that county officials allowed Bates to “play cop” and pressured investigators to find that the part-time deputy’s use of force was justifiable. Andre Harris, the brother of the man slain during the 2015 gun sting, called out Bates’ hypocrisy. “When any convicted felon gets out before the end of his sentence, he knows the deal: If you don’t abide by the rules, then you risk going back to prison,” Harris said. When asked for comment, Meek Mill, who violated his probation for allegedly popping wheelies on a dirt bike, did not comment.